As your family member ages, you may be faced with a common dilemma: your loved one needs assistance, but not medical help. Many people are only aware of medical services for the aging, leaving them wondering what to do when an aging family member doesn’t need regular medical assistance but struggles to live safely on his or her own. Several kinds of home care services are designed to fill in this common gap. Sometimes home care and home health agencies are confused. Both types of services exist to provide support to aging individuals in the comfort of their own home. You can opt for short-term or long-term services in either case. The main difference, however, is the purpose of the services offered. Although not assistive medically, home care agencies provide support that affects the quality of life of aging clients. The services offered by caregivers tend to be both personal and practical instead of clinical. The kinds of home care services offered through their caregivers are numerous. Whether your family member just needs help getting to and from their favorites activities or would benefit from daily help around the house, a caregiver will likely be able to assist. Your aging family member may be doing well living in their home on their own, but simply be lonely. Maybe your loved is happy and energetic but has trouble getting around independently. 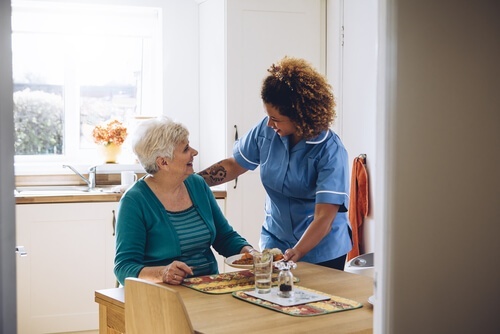 Perhaps your loved one is receiving health care at home while recovering from surgery but needs assistance with housework and personal care in the meantime. Home care services are unique in that they can be tailored to meet the non-medical needs of your family member in the next season of life. If you think your family member may benefit from any of the services referenced, or similar services, learn more. Download this free Guide to Home Care today.